Musical life in the New Sweden area is rich and active in spite of the relatively small number of venues and events where it can be heard publicly. Various vocal and instrumental groups meet to practice and occasionally perform a wide range of music. However, traditional Swedish music, like many of the traditional Swedish arts in New Sweden, does not have a strong public presence throughout the year. Those who sing and play Swedish music today do so mostly in their homes. Over the years, there have been two major exceptions to this. One is the annual Swedish Midsommar Celebration of the summer solstice. The other has been the regional and statewide performances (including trips to the Maine Festival) by the "New Sweden Little Folk" traditional dance group, comprised of children from the area. Local residents, as well as those from other parts of Maine and beyond, regard the Midsommar Celebration as the special time when Swedish Colony heritage is put on public display. Even months in advance there is an excited anticipation among locals about the weekend event. During "Midsommar" the Maypole is decorated with wild flowers, carried up a long hill, and raised just like it is in Sweden; traditional Swedish food is prepared and served at the Covenant Church (and rumor has it you should buy tickets early because it's always a sell-out); people dance ring dances around the Maypole; traditional music is performed on its own and to accompany the "Little Folk" with adults and children in traditional costume; The New Sweden museum and gift shop attracts large crowds; And, an interesting addition for this year, two hours will be dedicated to "older folks telling stories of the good old days." Most of the music performed at Midsommar is dance music, one of four traditional Swedish genres which coexisted in the Swedish Colony from the first settlement. The four genres are: Dance music, Folk songs, Band music, and Religious Hymns. Traditional Swedish dance music is usually a single melodic line with chords performed by at least a duo consisting of a guitar and either fiddle or accordion. Improvised or arranged combinations of fiddles and/or accordions can be adapted to fit any piece. Other instruments such as the harmonica or piano/keyboard are also sometimes used to play melody and/or chord progressions. There are four types of Swedish dance tunes: the Schottis (also known as the Swedish Hop), the hambo (short for hambotakt), the waltz, and the polka (or polska). A typical performance combines all of these in no particular order. Within these types are commonly known groupings such as the "Jamtlandsk or Bride March" and the "Ganglat or Walking Tune." Many of these tunes will frequently alternate between major and minor keys and performers sometimes modulate to other keys within a tune. Adella Johnson is a lifelong resident of New Sweden who was born into a musical family and began playing guitar after receiving a guitar for grammar school graduation. As a duo with her Mother Lillian, who until recent years played accordion, Adella has performed "probably hundreds" of times at various occasions including Midsommar Celebrations with the "Little Folk." She remembers growing up and eventually performing in an environment where "barn dances, cellar dances, and house party kind of things happened all the time." Local friends and relatives would gather informally, often at Lillian Johnson's house, and dance Swedish dances into the night. Adella remembers a huge kettle of coffee on the stove, because a regular pot just wasn't enough for the 20-50 people. She also wonders aloud at how "into her 70's Mom stood there for four hours with that heavy accordion hanging on her back. We all just loved it. It was such a fun time." And that "the women always put on a big feed of sweets and sandwiches." The duo also performed at organized dances at VFW, American Legion, and Knights of Columbus halls and at Hunter's Breakfasts. They appeared on Loring Air Force Base Television in the late 1950's, and on a Swedish documentary aired in Sweden in the 1980's. They were even featured on Good Morning America with the "Little Folk" dancers in the 1970's. Listening to homemade cassette recordings of Adella and Lillian reveals how they were indeed musically very "together." It's enjoyable to listen to and Adella recalls that it was the "togetherness of their rhythmic skip"--the rhythmic subtleties that must be performed in unison--that made them so popular with dancers over the years. This active community dance tradition gradually faded away in the 1960's. Silas Gustafson, an accomplished accordionist who often performed with the Johnson's over the years, cites television for causing the change. He says "Pretty soon everyone had a t.v. and they stayed home all the time. And so the dances just died away." He adds that before the 1960's, "people visited a lot and they were mainly related second, third, or fourth cousins. Or at least everyone knew each other. Now you don't hardly know your neighbor." Silas was born in Minnesota and married Anita Strid who was originally from New Sweden. They moved to New Sweden in the early 1950's. He grew up playing the guitar and accordion in a musical and "very Swedish" family. Like Adella, Silas recalls the frequent house dances as being "always a good time. The women would be talking, the men would have a beer, the kids would be running around outside in the dark playing together." With a laugh he remembers, "At the end of the night we'd go to get the little kids and they'd be sleeping cross-ways on the beds just so they could each have a space." Silas also remembers that there was a kind of method for finding out where the dances would be on any given Saturday evening. It seems that, around the time folks were finishing up chores and dinner, anyone looking for the party would take a drive to see where the cars were parked. Silas says matter-of-factly, "Usually a ride around ‘the block' [a 15-20 mile loop formed by Rt. 161, Station Rd. and Rista Rd.] would turn up where a lot of the action happened," including the Johnson and Strid homes. Adella and Silas both remember that drinking beer was a big part of the evening, but was always done outside or in the car, "kind of on the sly so the men felt like they were getting away with something," chuckles Silas. They both also remember that the musicians chose the dance tunes (hambo, waltz, etc.) and therefore set the pace for the evening. Family members didn't think twice about dancing with each other. Silas says "They'd just grab anyone and start dancing if they liked the tune." Silas characterizes the evening as a time for joking around, telling stories, teasing, and even doing a little bragging. Although, he says, "Most of the guys who told funny stories told the same ones over and over again. But they still got a good laugh because there's not much new to tell when you don't go far from here." He remembers, "Many of the stories were about work; like somebody having trouble with some machinery and doing something foolish to try to fix it." One story he remembers was told more than once to tease Waldo Anderson. It seems that Waldo had been bragging about how good he could drive Silas' motorcycle, if Silas would let him. Finally Silas agreed to let Waldo drive. Sitting in Silas' driveway Waldo fired up the cycle and popped it into gear. "What happened next," Silas says, "is that Waldo took a very short ride into my garden and fell right over." Clearly, New Sweden has a rich social and musical history revolving around dance parties. Adella, Silas, and other musicians agree that, if not for the Midsommar Celebration revival begun in the 1970's, this part of their music tradition would probably be inactive and would certainly be buried from public view. (See elsewhere in this report for detailed discussion of this revival.) Consequently, the Midsommar music and dancing, as well as other aspects of the celebration, take on a very nostalgic quality; It seems to be a time primarily for remembrance of family and tradition. In fact, many local families organize their reunions around the Midsommar Festival. Or people with roots in the area choose to visit at that time because they'll get to see old friends who have spread out across Maine, New England, and beyond. Silas says he can understand why many young people don't take such an interest in what goes on at Midsommar. As dear as the music and local history is to him he admits, "It gets kind of boring. It's always the same music [as opposed to the Country and Western music he's played for years which is continually infused with new repertoire and "sounds"]. And it's the same stories every year about how the Swedes came here and all that." He laughs and says, "I think the older people all get together there to make sure the stories are being told right." A relatively small number of people work hard to make the Midsommar Celebration happen. It appears that as a group they share an idea that it should signify a connection to the past by resembling the past. It is easy to see why such an event is so meaningful to many who are connected to this history. However, Silas comments do raise the point that there can be conflicts between preserving the past and somehow fostering the evolution of local tradition. New Sweden is not unique in finding itself in this modern-day cultural conundrum; As local identity has moved further and further from "Swedishness" (or any other local identity) into popular culture "Americaness," what choice is there but to preserve the past in a reified--some would say stagnant--state that is unlikely to attract many new and younger participants? Exploring possible avenues for solving this problem would be a challenging but especially practical way to follow-up on the current Discovery Research. For a variety of reasons discussed elsewhere in this report, the Swedish Colony would make an interesting and appropriate setting in which to try various regional, cross-cultural collaborative, educational, and public performance experiments. As a testament to how well the preservation has succeeded thus far, many locals describe a similar reaction among Swedes who have traveled from Sweden to visit the Swedish-American Midsommar Celebration. "They say ‘You're more Swedish than us!' and that ‘This is more like Sweden than where I live in Sweden'," reports Rena Hultgren, manager of the New Sweden gift shop. The "New Sweden Little Folk" dance group has a long history dating as far back as the 1950's when Monica Soderberg was the leader. After a lull in the late 1960's and early 1970's Karna Olsson, who had recently moved to the area with Phil Carlson, took over the group. Karna and Phil, along with David Anderson and others, initiated the revival of Midsommar at this time as well. (See report attachment for more details on this.) Adella and Lillian Johnson frequently provided the music for dancing. In the 1980's Nancy Holmquist-Roble, a New Sweden native and elementary teacher, began to lead the group. During the latter part of her tenure in the 1990's, Lillian and Adella began playing less and fiddler Steve Boody stepped into the picture. Steve is from Massachusetts and, although he is not Swedish, his Irish fiddling background made for an easy transition to play the Swedish tunes. Currently the most active traditional musician in New Sweden, Steve is called on to play with the "Little Folk," at Midsommar Celebration, and at the Santa Lucia observance held at the grade school in December. He also plays at weddings, churches, nursing homes, and funerals. In regard to learning new material he says, "Luckily I read music from various books, because there's no other way to get new tunes locally." Steve also initiated the use of music during the processional carrying the decorated Maypole the quarter mile to its destination. He states, "A few years ago I learned some walking tunes and suggested that fiddles lead the way, just like they'd do in Sweden." He has found various people to accompany him including Kate Scheidler who, until recently, lived in Stockholm, Maine. Kate is Scottish and Irish and also made the transition to play the Swedish repertoire. Even more of a transition was donning the traditional Swedish clothing at Midsommar. With her bright red hair and Irish accent, she laughingly says, "If I can be a Swede, anyone can." Silas Gustafson says he still plays at Midsommar once in a while. But he avoids shouldering his thirty pound accordion. Instead he uses a modern electric keyboard set to sound like an accordion. He also programs rhythmic accompaniment so that he can sound like a multi-piece group all by himself. On Sunday afternoon at the very end of the Midsommar Celebration program, Steve Boody starts to play the first few notes of a long-dance tune. Steve says, "Right away a few people hook-up and start prancing around. Pretty soon the whole group is up and holding hands in one long snakey dance that goes on for ten minutes." Unlike dance music, folk songs have sung lyrics and can be performed with or without instrumental accompaniment. They usually tell stories or are about topics related to seasons, holidays, rites of passage such as marriage, work, etc. In New Sweden it appears that Swedish folk songs were commonplace in homes well into the 1960's. Several residents recall hearing Swedish lullabys as children and singing other songs as a family. However, unlike the dance music tradition, folk songs are not all that visible today. It seems that folk songs were not ever valued for public performance the way dance music was for social events. Thus, the folk songs normally handed down through an oral tradition of repeated listening and singing have faded rather quickly. And previous generations often sang the songs only in Swedish, making learning and singing awkward for more recent generations who didn't learn the language. In fact it's hard to find anyone who will sing the folk songs. Nancy Holmquist-Roble knows and sings quite a few, especially children's songs and ring dance songs (sung by children while dancing). And Adella Johnson knows many of the "old songs." But she says, "It's been a long while since I've sung any of them for anyone. I'd have to practice!" Helen Borjeson is known to have sung a lot folk songs. She says she remembers the words and melodies well. But, at ninety years old, she states, "I'm too old and my voice is too gone for singing them." Even so, she would be an excellent person to help trace the history of folk songs in New Sweden; what songs were sung? by whom? where? etc. With further assistance from Nancy, Adella and others, it might not be too late to put together a picture of the folk song tradition in New Sweden. Such an effort would keep this unique and tangible body of local traditional music intact for future generations to refer to and build upon. In the late 19th and early 20th century, band music was immensely popular in the United States. Grown out of the military marching bands, this style of music used brass instruments and drums to create an uncommonly loud and emotionally stirring presence. John Sousa's compositions and performances typify the sound of this genre. As this new form of popular music took hold on the public in the latter half of the 1800's, communities throughout the country started their own bands. This "community band" tradition, comprised of amateur musicians playing primarily for local residents was strongest in the New England states. New Sweden has a rich community band history. With roots as far back as 1897, many local residents can recall the days when band concerts were held every summer weekend at the W.W. Thomas Memorial Park in New Sweden. For many years the bandleader was Henry Anderson. The town of Stockholm also had its own band from 1923 to 1932. Through their ability to read sheet music and perform together, these bands provided popular entertainment locally. This began in an era before mass media (film, t.v., stereos) played the dominant role in community and home entertainment. The bands were valued for their ability to entertain. But they were also valuable for providing a time and place for socializing. The local concerts created a personal, yet nationally connected, sense of identity for the community. The towns took great pride in how their bands sounded, what their uniforms looked like, and the attractiveness of the community-centered bandstand where they performed. Following Sousa's lead, community bands played a great variety of popular music from the day: marches, arrangements of parlor songs, minstrel songs, folk songs, and even European art music such as Beethoven compositions. New Sweden is unique in that its band apparently also played arrangements of Swedish dance tunes. Lorraine Jepson, daughter of longtime bandleader Henry Anderson recalls that the band used to play a number of these tunes. Also popular was an arrangement of the "Swedish Anthem" which was performed at the start of many baseball games and other events. Unfortunately, Lorraine knows of no recordings of this wonderful twist in New Sweden's band history. However, some effort may turn up sheet music which would indicate what Swedish tunes were played and how they were arranged. A good number of people can offer recollections of the New Sweden Band form this century, including Lorraine's son Brent Jepson. The Lutheran and Covenant churches were both transplanted to New Sweden in the 19th century with Swedish immigrants. Over the years the churches have retained elements of Swedish language and music, especially in the singing of religious hymns in Swedish. Regular church service music is conducted at the Covenant church by either Alma Huddleston or Susan Clark. Each play piano/keyboard to accompany singing. For special occasions, Steve Boody, Nancy Holmquist-Roble, and others join to sing and play as a group. Alma moved to New Sweden in the 1980's and has been serving the Church for the last twelve years. She is not Swedish and, although she had played Church music previously, she was unfamiliar with Swedish music when she began at the Covenant Church. She enjoys remembering, "The Christmas hymn "Lissna" was the first traditional Swedish hymn I heard. It's just the loveliest, sweetest hymn. I think that sold me on Swedish music more than anything else." Alma's regular repertoire consists of some Swedish hymns which have become so popular in other Christian churches that most people don't know them as "Swedish" hymns. These include: "How Great Thou Art," "Day by Day," and "Children of the Heavenly Father." These and most hymns sung at the church are in English. Alma says that, in contrast with even 10-20 years ago, now she only plays other "really traditional Swedish hymns" two or three times per month. She speculates that the reason for this is lack of familiarity with the language and music. "If people at church can't sing the songs we don't want to play them," she says. And, she adds, "Even at Midsommar, when we sing both the American and Swedish Anthems, the Swedish one gets quieter and quieter every year because fewer people know it." It is a telling sign of the times to hear Alma lament that, "I play the old Swedish hymns at funerals more than any place else now. A lot of the old people and their families want that music." Still, Alma feels that Swedish music will continue to have some presence in the church. She says she finds the rewards for playing it are great, even in the face of a fading tradition: "When we do sing those old hymns in church I love it. I really love to hear the older people sing them because you can tell how meaningful it is to them." As a field researcher curious about traditional arts I enjoy being surprised often by what I find in the field. I especially enjoyed the unexpected surprise of seeing a Swedish psalmodikon for the first time at the New Sweden Museum. The psalmodikon in made from a single string mounted on a wooden resonator box and can be plucked or bowed. The one on display at the museum is roughly 40 inches long and has markings indicating finger positions. It most closely resembles a dulcimer, but with only one string. In 1828, Swedish pastor Johannes Dillner offered a solution in the psalmodikon (actually an ancient Greek instrument; the word meaning "that pertaining to the song"). It became immensely popular because it was inexpensive, easy to learn, and most of all, it succeeded in encouraging congregations to sing more. When the first Swedes arrived in the undeveloped woods of Northern Maine they brought their skis. It was a sport and mode of practical transportation almost entirely unknown to New England. Well into this century kids in New Sweden skied miles to get to school and adults hopped on their skis to work, shop, or visit all winter long. Shirley Sjosted, curator of the Stockholm Museum even showed me a "convertible carriage"--one that goes on wheels or skis. A plaque at the museum hangs in recognition of New Sweden's contribution for bringing skiing to the United States. As skiing spread across Maine in the early 20th century, New Sweden became known for its highest quality ski makers. And in the 1920's, when Maine communities began organizing Winter Carnivals, residents of the Swedish Colony were always top racing competitors. Although he skied as a youngster, lifelong New Sweden resident Ralph Ostlund didn't start racing until age 55. At nearly 80 he's still racing. Judging by the number of trophies and ribbons in his trophy room, the late start didn't hurt him too much. He says skiing was in his family as long as he can remember. His father made the kid's skis and the whole family were ski jumpers. "My brother Buck used to ski the Bangor to Caribou Marathon [in the 1930's] which was real serious, about 180 miles," he proudly recalls. Referring to New Sweden he says, "We had an athletic club and we always had some of the best skiers in the area. We'd compete against other clubs and each other. New Sweden was proud of their ski team because they won a lot of carnivals and they bought the club white ski suits." Ralph has seen the technology of skiing go from homemade wood skis with leather or "rat-trap" bindings to fiberglass skis with highly technical waxing techniques. He remembers when "they used to have wide skis and only one pole so that they could get work done on their skis. And then my wife and I skied with the kids for fun. And then I got into racing and waxing and I go on trips to Quebec or wherever I can." Maybe it's because he has witnessed the progression of skiing as an American sport that he readily acknowledges respect for some of the younger racers he sees out there on the trail. He says "I don't know if they're any tougher than they used to be. But there are some really good skiers now. Of course the equipment is better and they learn skate racing earlier. But there are really good skiers around." At the same time it's evident that Ralph sometimes misses the atmosphere of the 1930's when Winter Carnivals and skiing in New Sweden were at their peak. He says "That was great fun," and speculates, "It was so popular because there wasn't a lot of money around for people to do other things. And everyone skied at home. And the sport wasn't so expensive or complicated." The Swedish Colony is comprised of the adjoining towns of New Sweden, Stockholm, Westmanland, and Woodland, all located just northwest of Caribou, Maine. The landscape is one of woodlands interspersed with open fields, farms, and sparsely populated rolling hills. Large and attractive roadside signs indicate the boundaries of the Swedish Colony. Since the Colony was first settled 130 years ago, and many people of non-Swedish heritage have lived and continue to live within the Swedish Colony borders, one might wonder what it is that makes the region distinctly Swedish today. Through numerous field interviews I have observed a distinct Swedish-American heritage within the Colony which, though changing over time, has been continuous since its 1870 inception. However, these Swedish traditions and Swedish roots have not grown wholly on their own, as a by-product of modern development. Swedish traditions and a Swedish sense of identity have been maintained in large part through the cultural activism of local residents who have actively promoted local cultural and historical pride and awareness. This culminated in what I'll call the revitalization period of the 1970's. And to this day, a relatively small number of people work to keep traditional culture and arts visible. Woven throughout this history is a complex relationship between Swedish Colony local "insiders" and people from away--including people of Swedish and non-Swedish heritage, as well as Swedes from "the old country" of today. The first bold move of a kind of cultural activism to do with the Swedish Colony was the very way in which the town of New Sweden, first in the Colony, was established. Throughout the 1850's and 60's Maine's statewide population, and especially its northernmost population, was in decline. The State Government assigned lieutenant of immigration W.W. Thomas to address the problem. Having great respect for what he called "the Swedish integrity," Thomas went to Sweden to recruit immigrants to live in the northern Maine woods. Recruits had to be literate, able to farm, and able to provide character references from their local church parish. They were also expected to pay their own fare to get here. In return, each received 100 acres of land and an opportunity to be part of the "American Dream." The first group arrived and settled New Sweden in 1870, with more groups arriving over the next 30 years to settle Stockholm and other nearby communities. And so began the history of Swedish-American heritage in the region. Two important aspects of the orchestrated move to this location are noteworthy. First, the livelihoods and lifestyles of the original Swedes and their descendants were determined by the economy of the region. At first focused on self-sufficient farming, the Swedish Colony soon became engulfed in the wood manufacturing industry that swept across northern Maine around the turn of the 20th century. Millwork became popular and common products were clothespins, plywood, lumber, and, at one time, the region was promoted as the "veneer capital of the world." As the mills grew, so did the influx of French-Canadians. The second result of moving to this exact location is that it created what native resident John Hede calls a "pocket." The area has always been rural to the point that it is somewhat insular, allowing Swedish traditions and identities to more easily remain intact. On the other hand, Caribou, as a larger economy, is close enough to have kept the Swedish Colony from experiencing mass exodus in search of work when the mills eventually shut down. (Mill closures did cause many to leave in search of industrial work in other areas of dominant Swedish immigration; mainly Worcester, MA. But a good many were able to stay and the community remained.) It is not an overstatement to say that, if W.W. Thomas, once known as "Father of the Swedes," had settled "his children" in Caribou, the subsequent years of economic and social flux in Caribou would have heavily diluted the Swedish cultural presence. The hue of Swedish color in the Swedish Colony is stronger because time has acted more slowly on its location. From the beginning, the culture, language, and traditional arts imported with the Swedish immigrants were fading. As is often the case in other places, many local residents with local heritage look back and lament the loss of language and gradual disconnection from traditional culture. However, many local people also say they recognize that one reason for this "loss" was that the original immigrants were trying their best to assimilate American ways and become fully "American." In an era before cultural and racial diversity was widely considered valuable, these immigrants thought themselves more successful if they and their children were less distinctly Swedish--at least outside of the home. For example, nearly all members of second and third generation Swedish Colony families I interviewed said that their own parents didn't teach them the Swedish language. Even fewer taught their own children Swedish. Silas Gustafson was born to Swedish parents in Minnesota and married New Sweden native Marylin Strid. They moved to New Sweden in the early 1950's to raise their own family. Only half-jokingly Silas says "We were so stupid. We never taught our kids Swedish because it never occured to us. Now I don't know if our grandchildren will be connected to the language or culture at all." He adds, "My wife and I don't even speak Swedish with each other unless we're around the grandchildren and we don't want them to know what we're talking about." This pattern of language loss was reinforced at the area schools where local residents remember students being punished if the teachers caught them speaking Swedish. Kids would use Swedish slang in private; But it was frowned upon in public. Another specific sign of assimilation was that a predominant musical and social past time was the weekly brass band concerts at New Sweden's Thomas Park, (named after W.W. Thomas). This reflected a popular trend of the late 1800's and early to mid 1900's, especially in New England communities. Judging from sheet music and performance notes, the "New Sweden Band" repertoire seems to have been similar to others across the country; marches, waltzes, arrangements of classical pieces, and popular tunes. This signifies the community's strong identification with American popular culture of the day. However, the Swedish dance music tradition (described elsewhere in this report) existed alongside the bands, even if it drew smaller crowds than the band. And Lorraine Jepson, daughter of Henry Anderson who was the leader of the band through the middle of the 1900's, remembers hearing arrangements of Swedish tunes, including the "Swedish Anthem." Swedish Colony residents have long been American in their day to day participation in modern life. But they embody "Swedishness" in shared personality traits, shared family and immigrant history, and whenever they choose to cooperatively enact any traditional cultural activity in private or public. The attitude of the early immigrants is understandable. One assumes that they believed that, for what they readily sacrificed in cultural identity, they gained in social participation status within educational, economic, and political realms. But this mostly one-sided leaning didn't last long. The formation of the New Sweden Historical Society in the 1920's is the first significant indication that some of the local residents had become very interested in preserving aspects of traditional Swedish-American culture. This period can be seen as the first step toward the particular kind of self-conscious and self-promoting bi-culturalism that defines the Colony today. Around the same time the historical society was established, the annual Midsommar Celebration gained reinvigorated status among locals, as well. This celebration, known in short as just "Midsommar," is a traditional Swedish holiday held on the summer solstice and includes the decoration of the Maypole with wildflowers. The event is held publicly in New Sweden and has includes traditional Swedish music, dancing, clothing, and food. The unofficial, yet diligent local historian of the Colony, Richard Hede, says that the New Sweden Midsommar is the longest running (since the 1870's) continuous manifestation of the celebration in the U.S.
As the early twentieth century progressed, the Swedish-American residents of the Swedish Colony evolved into a more fully bicultural community and became more solidly entrenched in the broader northern Maine landscape. For example, throughout most of the 20th century, the Swedish-American students were known to be frequent valedictorians at Caribou High School, attesting to their successful adaptation. The men were known as excellent skiers and excellent baseball players. Most men and women could dance American popular and traditional Swedish dances. As this process unfolded, relationships within the Colony and with non-Swedes evolved as well. Rosemary Hede says that, even to this day there is a pattern of friction between Stockholm and New Sweden that goes back many years. She remembers that when Stockholm needed a new elementary school in recent years, some educators and local government representatives suggested building a combined school on the Stockholm-New Sweden town line for practical reasons. Residents on both sides were adamantly opposed to the idea. Maintaining its own very small elementary school, (Stockholm's has just over 30 kids), presumably contributes to each town's sense of individual identity. Part of that identity, according to Rosemary, is that "the towns don't always get along. It's just been that way." Likewise, the town of New Sweden has had its own internal divisions. Route 161 runs North-South and on each side of that road were railroad tracks. On the west side the Aroostook Valley Railroad ran and had its siding station where goods were transferred, bought and sold. This side of Route 161 was known as the AVR siding. On the east side ran the Bangor and Aroostook Railroad with its own siding station, known as the B and A siding. As New Sweden developed, many original settlers and descendants of original settlers staked out property on one side of the tracks or the other. Territorial differences ensued and apparently continue somewhat to this day. Besides a few personal battles inappropriate for inclusion here, I found very few specifics as to why the B&A and AVR side of town had their dislikes and distrusts between each other. It does not seem that economic differences played a major role, although economic competitiveness between the stations may have. One person suggested that religious differences played some role. But mostly I heard that family differences held over from previous generations of Swedish immigrants has been the dominant cause of friction. Several local residents also remember the Ku Klux Klan being active and well-supported in the early part of this century. (Although it might make more interesting reading, I've refrained from including any names or public positions in this discussion. Such information is irrelevant to our understanding how the Klan operated in another era.) Since there were virtually no non-whites living in the region, the main targets were Irish Catholics and French-Canadian Catholics. More than one person remembers witnessing burning crosses across the street from the Stockholm Catholic church; And evenings when Klansmen were donning white robes in various barns; And children being forbidden to date or marry non-Swedes. Jerry Nelson is a local resident who explains that this aspect of local history was related to a national trend of anti-Papal sentiment. Many non-Catholics feared that the Pope and the Catholic church were becoming too powerful in political arenas. As was the case with Klan societies throughout the country, the Swedish Colony Klan seems to have been intent on intimidating and diminishing the local presence of "outsiders." The Swedes were certainly no longer the new foreigners who were just trying to fit in. By the 1910's, some forty years after the first arrival, the Colony had firmly established its identity, in part, by defining who was on the "inside" and who on the "outside." It's not an unusual progression of community life in American history. Adella, Silas, and many others mark the mid-1970's as a time of rebirth in activity and awareness of traditional music and culture. They cite Paul Carlson and David Anderson, both non-Colony natives, as major sources of that revitalization. Both connected strongly with their own Swedish heritage while studying (separately) in Sweden during college. David moved to the Colony in the late 1960's and Paul in the early 1970's. Along with reinvigorating the Midsommar Celebration, Paul helped introduce celebration of the traditional Santa Lucia holiday, still observed annually in the New Sweden school. His wife, Karna, continued to grow Monica Soderberg's children's Swedish dance group, "The Little Folk." It would be misleading to attribute this resurgence wholly to one or two people. These developments took cooperative efforts and talents. But the influence of Paul and other newcomers initiated a shift in the way traditional culture was valued and acted out. The period represents the beginning of a new era that valued cultural diversity (i.e. bi-cultural expression or display) for its own sake. With roots in academia (i.e. study abroad programs) this trend toward diversity and revival was occurring in urban and rural communities nationally. This new cultural value system transformed the Midsommar Festival into a cultural event to remember and resemble the past. (See elsewhere in this report for detailed discussion.) It was no longer a natural outgrowth of the community existing in proportion to the sheer number of local people who took an interest in organizing or attending. Annual attendance today is usually 400-500 people including many traveling long distances from in and out of state. Midsommar requires work on behalf of a relatively small number of people. These people are agents for maintaining the Swedish presence within the region; cultural activists doing cultural activism to keep local heritage visible. (Including native residents Richard, John, and Rosemary Hede, Rena Hultgren, Mabel Todd, Shirley Sjosted, and other individuals who devote time and energy to some aspect of local cultural preservation.) Other examples of this range from the Swedish Colony road signs to Discovery Research. Richard Hede is currently working on a Swedish Colony booklet that will be part historical and part "tourist information." The two have become intertwined in today's environment of "cultural promotion." Richard suggests that the 1976 U.S. Bicentennial was partly responsible for this period of resurgence of local tradition. Organization and presentation of bicentennial events, booklets, and exhibits sparked many to "look backwards" more than they had ever done before. The Stockholm museum was also founded at this time. 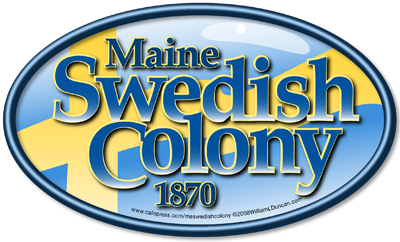 Later, in 1989 and 2000, the Colony organized reenactments of the Swedish immigration to Maine, complete with horse drawn wagons following the route taken by settlers in 1870. Nancy Holmquist-Roble, originally from New Sweden, is a singer and former leader of "The Little Folk." She says that many of the revival celebrations and events since the 1970's have taught her and other local natives "why we do the things we've done at home since we were kids." Several other transplants to the Swedish Colony are central to the current traditional arts and culture landscape. Steve Boody is a fiddler of non-Swedish heritage who learned the repertoire and has performed regularly for Midsommar, "The Little Folk," and religious services. Alma Huddleston, also of non-Swedish heritage, moved to New Sweden twelve years ago and is one of the keyboardists for the Covenant Church. As part of her repertoire she plays Swedish hymns occasionally at church. She has an even greater traditional repertoire she plays at funerals for mostly older residents whose families request Swedish hymns. Brenda Jepson moved to the Colony just six years ago, having lived in central Maine and London, England. She feels a strong connection to her Swedish heritage and, as a filmmaker, she has helped preserve and promote local "Swedishness." For instance, her current project is a documentary of last year's immigration reenactment. Brenda states, "There is an insider-outsider thing going on here. But the outsiders who come here by way of marriage or whatever get involved and keep the tradition evolving." Kate Scheidler, born in Ireland and raised in Scotland, played guitar with Steve Boody and taught at Stockholm elementary until moving away recently. It was Kate who said, "I see they are trying to keep their culture alive and I want to support that. They asked me to play guitar and dress in Swedish costume for Midsommar and I said ‘sure I'll be a Swede.' If I can be a Swede anyone can," she says with a laugh. That is a change. The sight of a red-haired Irish woman in Swedish dress playing at Midsommar would have confounded many from earlier generations in New Sweden. This has been the pattern over the years; Swedish Colony blood and culture within its borders is diluted by the outside influence of modern life and popular culture; While "Swedishness"--evidence of the Colony's distinct cultural history and character--is also continually boosted by the outside influence of individuals. Without outside influence since the 1970's it appears that the region's Swedish traditions would be far less active and visible. Throughout the last century there has been a strong enough sense of "Swedishness" to draw in interested newcomers. Paul, David, Brenda, and others have gravitated to this place because of its unique Swedish-American character. And in doing so, they have helped reshape and perpetuate this character. It is noteworthy that nearly all of the local residents "from away" say that most of their close friends are also people "from away." There remains a thin veil that separates settler descendants and very long-time residents from more recent "immigrants" to the Colony. It seems to maintain a subtle status-like division within the community. Echoing the sentiment of others, one person says that, "Everyone is nice to each other. It's just that, if your family isn't from here, people are welcoming but not inviting, if you know what I mean." It's not that mean-spiritedness prevails; One recent "immigrant" speculated that an attitude of friendliness is simply balanced by a value placed on privacy and an ideal regarding the "purity" of New Sweden's "Swedishness." This report was funded in part by a grant from The Maine Arts Commission, the New Century Community Program, and the National Endowment of the Arts, a federal agency. The New Century Community Program is a collaborative initiative of seven cultural organizations providing matching grants and technical assistance to Maine communities. Funded by the people of Maine, the program seeks to assist towns in developing their cultural and educational resources.